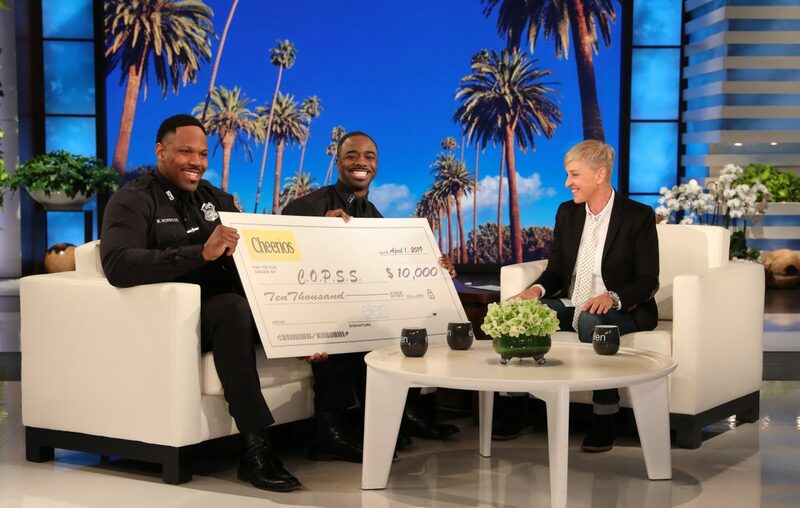 Buffalo police officers Michael Norwood Jr. and Mo Badger busted a couple moves as they were introduced by daytime talk show host Ellen DeGeneres on a segment of her eponymous talk show that aired Monday. The partners – dubbed Buffalo's singing cops after a video of the pair crooning in a restaurant went viral – demonstrated their wit and charm, and also serenaded DeGeneres with a brief rendition of the 1964 Temptations hit "My Girl, before exiting the set with a $10,000 donation to their foundation from DeGeneres and Cheerios. "Back home in Buffalo, they call us the Buffalo Bad Boys, you know, because of the '90s movie with Martin Lawrence and Will Smith," Norwood told DeGeneres. During the segment, DeGeneres asked how long they had been partners – two years – and about their disparity in height. Norwood is 6 feet 5 inches tall, while Badger is more than a foot shorter. Badger and Norwood, partners in the Buffalo Police Department's Housing Unit, taped the segment in Los Angeles last week. Badger was a professional gospel singer before joining the police force. Norwood is a former professional basketball player who played at Seneca High, Erie Community College and in Finland, until he broke his foot, he told DeGeneres. "At that point, I needed a new career change," Norwood said. Badger was a traveling gospel singer before he began working in the Buffalo Public Schools. Both he and Norwood, who grew up in Buffalo's inner city, wanted to work with youth, they said. "So there are a lot of negative videos out there with police officers, and this is a very positive one," DeGeneres said. "So you've made a big difference in the community, right?" 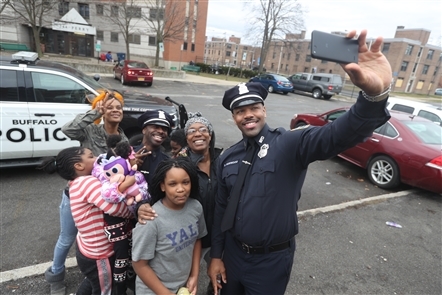 While giving shout-outs to Buffalo Mayor Byron W. Brown and Police Commissioner Byron Lockwood, Norwood said he and Badger are attempting to build bridges with Buffalo's youth and "really show people that we're human; we're not, you know, what you see on the media, and stuff like that." The duo, along with Lt. Todd McAlister, started an organization in 2016 called COPSS – Children Overcoming Police Stereotypes through Sports. The check donated to their foundation was from DeGeneres and sponsor Cheerios. Ironically, the oat breakfast cereal is produced in Buffalo and, on occasion, responsible for the distinctive aroma that wafts through downtown sections of the city. DeGeneres learned of Badger and Norwood after a video of them singing went viral – the pair was singing along with Ed Sheeran's "Thinking Out Loud" inside Salsarita's restaurant in downtown Buffalo.